I went to the Crossing Border Festival just to see Heather Nova where she should read a few poems on stage from her great book "The Sorrowjoy". She started at 10:45PM at the "Nieuwe de Lamar" theatre in Amsterdam. The weather outside was terrible but it was warm and cosy in the hall, where Heather would do her performance. It was raining cats and dogs outside. You could see on stage a pair of burning candles in a stand along with her acoustic guitar, which was connected to a guitar-amp. There was also a drum kit and some flowers in front of the audience. So you really had no idea what to expect afer seeing all those items on stage. A few minutes later Heather came on stage, dressed in jeans and a nice translucent shirt with glitters. She looked a little bit unusual and uncertain at the begin but after the first two poems she knew that everybody in the audience was paying attention to her and it was great. After a few poems she picked up her guitar and played a few songs and then she started to propose her poems again. god - but it made her think and she wrote a song about it. Everyone could feel the emotion and the feeling that Heather had when she wrote the song. 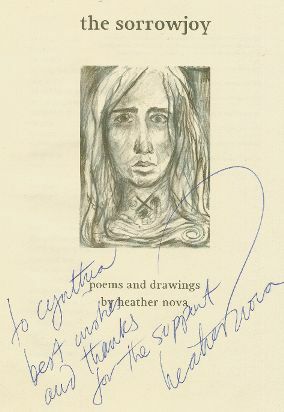 After the gig, Heather went of stage to sign her book the "Sorrowjoy" for people who wanted to buy it. It didn't took long for me to let her sign my own copy of the book. You can believe me or not, but it really is the truth. I swear to god it is. Well I was very happy and had a big smile on my face when Heather sign my copy of the Sorrowjoy, that I took along with me in my bag. Thanks Heather :-) Frontpage from the book " The Sorrowjoy", sign by Heather.